Nook 2 – Nook 2 Release Date? October 20th is the one year anniversary of the official unveiling of the Barnes and Noble Nook. At the time it was a big announcement. The Nook was the first ebook reader to offer ebook lending and to feature a color LCD display in addition to the E Ink display. Barnes and Noble priced the Nook at $259, the same price as the Kindle 2 at the time. It was more popular than B&N had anticipated; it sold out in under a month and it wasn’t until February before B&N retail stores starting getting them in stock. Then on June 21st Barnes and Noble introduced the Wi-Fi-only Nook for $149 and reduced the price of the Nook 3G to $199. 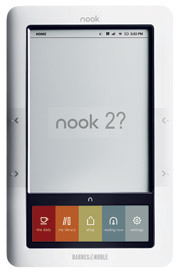 So when is the Nook 2 going to be announced? The Wi-Fi Nook is the same as the original, except the 3G wireless of course, so it’s not really a proper Nook 2. If Barnes and Noble has a Nook 2 in the works—a faster, lighter, updated version—they’ve certainly been quiet about it; there aren’t even any substantial rumors floating around the net. If B&N were to launch a Nook 2 and have it ready in time for the holiday season—something they botched last year by underestimating the demand of the product—they would have to announce a release date within the next couple of weeks to have it ready to ship by the beginning of December. The way I see it, if B&N doesn’t reveal a new Nook by the 10th of November, it probably won’t be happening for a few months down the road. Update: Barnes and Noble has sent out media invites for an event on Tuesday, October 26th in New York to make an announcement. It’s likely that a new Nook will be unveiled at this event! My personal guess: no NOOK 2. B&N doesn’t need another “can’t ship/doesn’t work” debacle. The original NOOK hardware is still state-of-the-art, if you don’t ding it too hard for the Vizplex film. B&N just rolled out a new NOOK 3G design with lower-cost internals, and I can’t imagine they’re going to throw that design away so soon for a NOOK 2. I wouldn’t be stunned if B&N brought out a “premium” NOOK 3G with Pearl, sold alongside the existing Vizplex NOOK 3G and Vizplex NOOK Wi-Fi. From my lack of knowledge, I think that wouldn’t involve any design differences… just installing a different film. They could also do a dark gray bezel without any redesign. There’s almost certainly a big software update coming. B&N’s basically said so, although as always they’re extremely coy about what’ll be in it and when it’ll happen. I expect another big price reduction, and soon. Amazon and B&N certainly have to feel an intense craving to push the prices of their Wi-Fi models down to $99 or less for the holiday shopping season. That price point should send sales rocketing. I admit there’s a very tiny chance that B&N might instead introduce a wired-only NOOK at that lower price-point. I really don’t think that’ll happen. I agree. It just doesn’t seem like B&N will unveil another Nook anytime soon. I thought that perhaps they’d want to release a large-screen ereader like the Kindle DX since they have such a big foot in the higher-education market, but it looks like they are content with their NookStudy app and other ereading apps. If they were going to do something like that it would probably need to use color anyway. Just bought the Nook Color and love it. I might write an app for it using the SDK.